Tropical Storm Claudette made landfall in the Florida Panhandle early Monday. The storm hit near the eastern end of Santa Rosa Island, just southeast of Fort Walton Beach in Florida, about 1:15 a.m. ET, the National Weather Service said. Claudette is expected to move through the Panhandle and into southern Alabama, CNN meteorologist Jacqui Jeras said. Even before Claudette made landfall, the storm’s outer bands pounded the area with heavy rain, with officials warning that some coastal areas had the potential for localized flooding. “What we’re just mainly asking is residents to stay off the roads tonight, and if you do approach a flooded area on a roadway, turn around,” said John Cherry, spokesman for the Florida Division of Emergency Management. iReport.com: Are you in Claudette’s path The storm could bring 3 to 6 inches of rain, with isolated amounts up to 10 inches, across portions of the Florida Panhandle, central and southern Alabama and extreme southwestern Georgia. 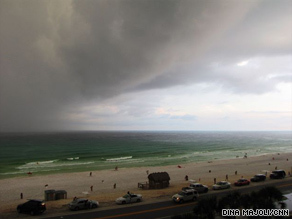 Storm surges and isolated tornadoes also were possible across portions of North Florida. Watch iReport on Claudette’s approach » Authorities urged voluntary evacuations in the low-lying Alligator Point area of Florida’s Franklin County because of concerns about possible flooding, said Mike Stone, spokesman for the Florida Emergency Operations Center. He said he knew of no other evacuations in the state. Mariners in the Panhandle and Big Bend areas of Florida should stay at harbor, the division of emergency said in a statement. Meanwhile, two other storms were in the Atlantic Ocean on Sunday. Tropical Depression Ana, which was downgraded from a tropical storm Sunday afternoon, was moving across the Leeward Islands late Sunday, while Tropical Storm Bill was gaining strength as it followed behind Ana. Ana was about 25 miles (40 kilometers) southeast of Guadeloupe shortly before 11 p.m. ET Sunday. It was expected to enter the northeastern Caribbean Sea and weaken as it approaches the Dominican Republic on Monday, the Hurricane Center said. It was moving east near 26 mph, and its maximum sustained winds were close to 35 mph, the center said. Tropical storm watches were in effect for Puerto Rico, the U.S. Virgin Islands, the British Virgin Islands, Montserrat, Antigua, Barbuda, St. Kitts, Nevis, Anguilla, St. Maarten, Saba, St. Eustatius, Guadeloupe, St. Martin, St. Barthelemey and part of the Dominican Republic. Ana was expected to drop 2 to 4 inches of rain over the Leeward Islands, with isolated maximum amounts of 6 inches possible over mountainous terrain, the hurricane center said. Tropical Storm Bill, forecast to become a hurricane Monday, was in the Atlantic heading west-northwest with maximum sustained winds of 70 mph. The storm’s center was about 1,320 miles (2,120 kilometers) east of the Lesser Antilles shortly before 11 p.m. ET Sunday.